Some great games were played this past weekend! And several of them helped shake up the rankings. We are confidant that progress is happening in every team whether the statistics properly reflect it for everyone.... well that is never the full story. But for all of the boys of Autumn, and the families and leaders who've invested so much in them, we present to you the newest revision of the rankings. To all the teams who moved up; DON'T STOP! And to all the teams who had a setback, EVERY champion has had many setbacks! The thing that made them better was that they didn't stop trying! Lighthouse is 3-2 not 3-3. Jed, you're right! 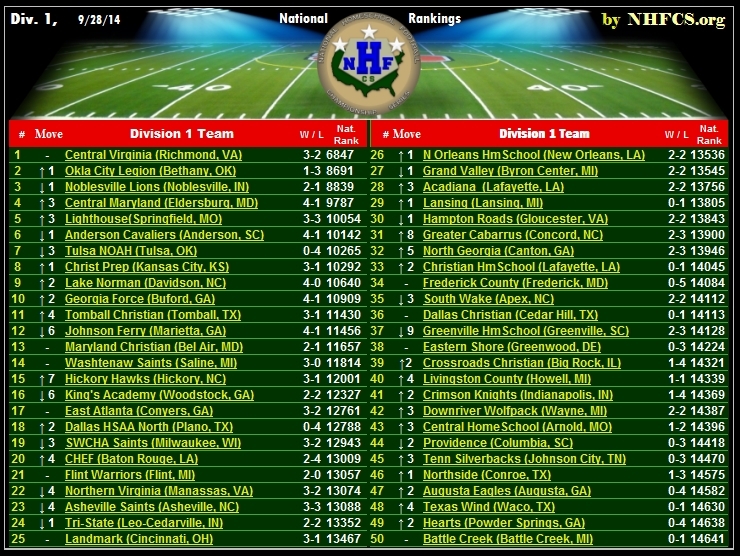 Brent Davis usually deals with Maxpreps, so if you have him notified I think he can get to the bottom of this. I've seen explainable discrepancies before, but this is a new one for me? Anderson Cavaliers and Greenville Homeschool are not homeschool teams. The use public school and private school players. You are right, and wrong. Most homeschool teams are not purely homeschool based. Many, if not most, allow students who attend schools that do not have a football program to play for them. Some teams do this as a necessity just to get enough kids to field a team, but the majority of their team remains homeschooled. Right now my starting offense has 10 homeschoolers and one non homeschooler who goes to a school that does not offer football. The first problem with having purist homeschool football is defining what a "homeschooler" is, and I do not see that happening any time soon.